Our annual charity event, Birdies for Animal Save brought out another great field & fun for all. 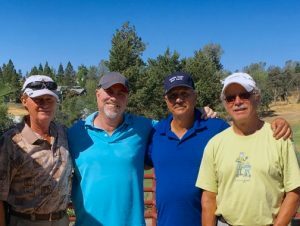 Claiming the top spot in this scramble format was the team of Ron Gaynor, Rob Barker, Jeff Liddle and Ted Schoppe. 2nd place went to the team of Rick Honey, Mike Blackston, Brad Branstad & Mike Schmidt. The team of Steve Graham, David Will & John Odom took 3rd, followed by the team of Dan Triano, Bonnie Marvelli & Billy Glover in 4th. Thanks to all our participants for helping raise money for a worthy cause. AnimalSave winners Gaynor, Barker, Liddle & Schoppe.